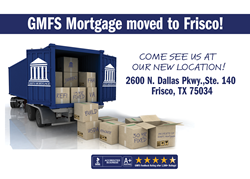 GMFS Mortgage, one of the fastest growing residential mortgage companies in the U.S., is celebrating a grand opening in Frisco, Texas. Frisco’s rapid growth and recent accomplishments, Best Place to Live (Money) and Best Places to Relocate (Forbes), make it an attractive location for the residential mortgage lender. Not only is GMFS Mortgage a top 50 lender in the country, but the largest residential mortgage lender in the state of Louisiana. GMFS Mortgage currently has branch offices in Georgia, Mississippi, Texas, Alabama and Louisiana while offering home loan products and services to 23 states. Rated A+ with the Better Business Bureau and winner of Torch Award for Marketplace Trust, GMFS Mortgage has remained the #1 USDA lender in the state of Louisiana for 5 consecutive years and currently services approximately $5.5 billion dollars of residential mortgages. GMFS Mortgage handles all aspects of the home financing process, from application to funding, giving them the ability to expedite decisions, control service levels and offer smooth and predictable closings. With a customer feedback rating of 4.8 stars out of 5, the North Texas market can feel confident working with GMFS Mortgage. “The processing, underwriting and closing—it all happens under one roof, creating a seamless process for our clients. I think that, plus the extensive mortgage industry experience of our seasoned staff, from Loan Officers to Processors to Underwriters; gives GMFS Mortgage customers—plus our realtor, builder and title company partners, a true advantage!” said Tammi Alexander, GMFS Frisco Branch Manager. Residents can stop by for a free, no obligation consultation at their new location on 2600 N. Dallas Parkway, Suite 140 or call (469) 786-8660. To learn more about GMFS Mortgage or to access educational resources such as mortgage calculators, Credit Tip podcasts, Mortgage Minute videos and more, visit http://www.gmfsmortgage.com. Headquartered in Baton Rouge, LA, GMFS, LLC originates residential mortgage loans, primarily in the southern United States. Founded in 1999, GMFS has approximately 250 employees. Since 1999, GMFS has funded home loans for more than 79,000 customers in multiple states resulting in over $12.9 billion in funding. GMFS, LLC is a licensed residential mortgage lender, operating as GMFS Mortgage, that is powered by great people who are changing lives and committed to even greater mortgage solutions.